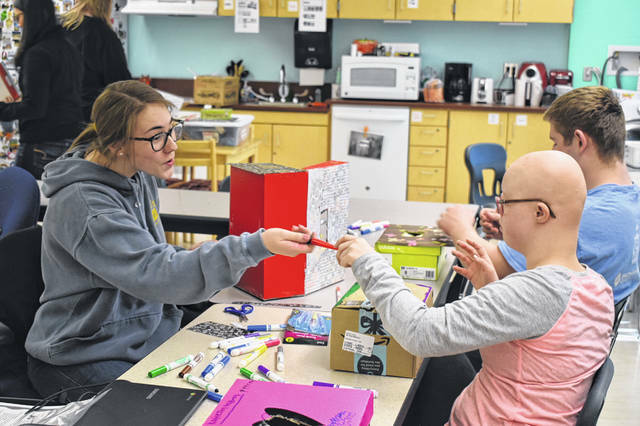 Senior Mackenzie Collett, left, works with junior Nathalie Young to decorate a Valentine’s Day box Friday during the Peer Mentoring Club at Hayes High School. Collett said she’s glad attendance in the club has jumped this year, which she attributed to positive word of mouth. Charlie Bruskotter, right, and Jordan Arata, left, duel in the Yu-Gi-Oh trading card game Friday in the Yu-Gi-Oh Club at Hayes. The club is sponsored by Spanish teacher Michelle Leasure, who said Bruskotter asked her if she could sponsor it so he and his friends could have a little time together to play the game. Seniors Megan Fanok and Paul Carter make tacos Friday in the Cooking Club at Hayes. The club was started by math teachers Joanne Meyer and Jake Shafer to teach students how to do healthy cooking on their own. Dozens of clubs returned and several new ones met for the second time this semester on Friday at Hayes High School. The clubs take place every other Friday during the students’ house period, and according to Assistant Principal Rex Reeder, they are designed to give students a place to share common interests. The clubs vary in sizes and subject matters ranging from the more than 160 students in two dodge-ball clubs to clubs centered around sports movies or ‘80s movies, and smaller clubs like the five-student crochet club or the nine-member sports debate club. One of the new clubs this year is the Cooking Club, which aims to give students familiarity and skills around the kitchen. 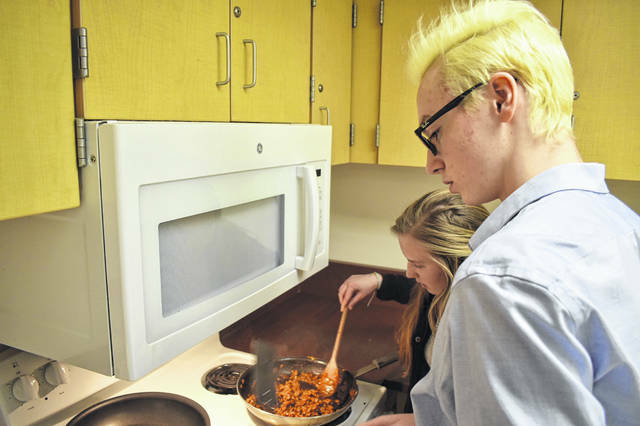 On Friday, students made taco seasoning from scratch and prepared their own tacos. Paul Carter and Megan Fanok, seniors in the club, said they joined because Meyer and the other club advisor, Jake Shafer, are two of their favorite teachers. “Plus it would be nice to learn to cook before college,” Carter added. A few doors down the hall, in the Peer Mentoring Club, students worked on building Valentine’s Day boxes and decorations with special needs students. Senior Mackenzie Collett said that the club has been running for a few years, and while it used to feature just a handful of kids, it has ballooned to 30 students this year. Collett said she spends many of her free periods helping out in the class and was encouraged to see such a big turnout. One of the new clubs this year took place in the auditorium as more than 130 students watched “High School Musical” and other Disney Channel movies. Spanish teacher Lauren Robbins said she spoke to students about what kind of club they wanted and heard that a lot of them would like to watch Disney Channel movies, so she created the club for them. Robbins said some students had been singing and dancing along with the film. 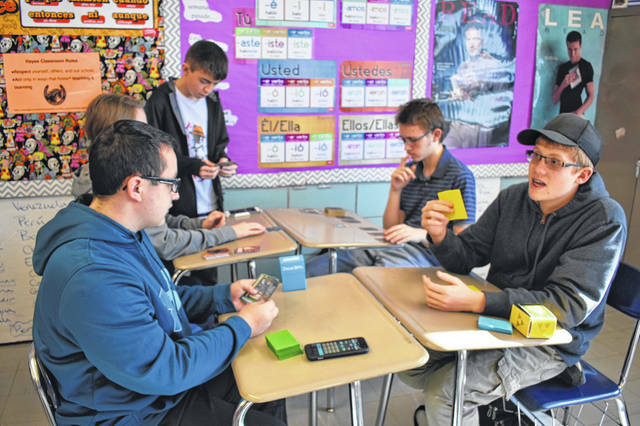 Another new club this year focuses on the Yu-Gi-Oh trading card game. The club was started by Spanish teacher Michelle Leasure after one of her students, Charlie Bruskotter, asked her to sponsor the club. Physics and physical science teacher Riley Jantz also started his own club this year called Travel the World, which he said is a way to share tips about travel based on his experiences. Clubs will continue every other Friday for the remainder of the year.